Finally an "adventure". It is hard to classify this excursion as an adventure since we've been RVing since 2008 and we've been to Alaska 3 times with our RV. 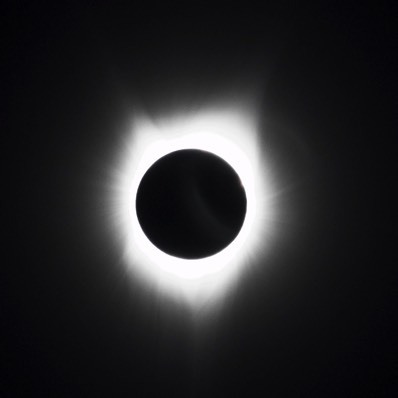 experience the Total Solar Eclipse. We are excited about visiting Wisconsin because we spent 10 years in Rockford, IL and Milwaukee, WI when I was with IBM and truly loved the mid-west. We really haven't visited that part of the the country since we left in 1982. It actually dawned on us that we actually bought a Coleman pop-up camper in 1972. We had taken trips to CO, WY, SD, MN and WI, but we already committed to visiting these 4 states with our 2017 Grand Design Solitude. We entered North Dakota on 8/15 an hour after leaving Summit, SD. That afternoon we stopped in a Bismarck KOA and went out for a great celebratory meal. We spent 5 days in Wisconsin Dells. This gave a pleasant break and allowed us an opportunity to recharge, get this journal published and plan our return route. We were headed for the eclipse in Boulder, WY and then to Monument. We'll get back to Monument for the first week of September to complete the Solitude warranty work and plan for our return to Cal-Am in Mesa, AZ. 3500 miles later we landed in Boulder, WY at Wind River View Campground on 8/20. After checking in, the hostess suggested that, instead of heading to Jackson, that we go to Cora (a tiny suburb of Pinedale). As proceeded north to get as far into the Totality zone, we saw warnings that the area we were headed to was full. We kept going for about 15 miles and saw 3 vehicles parked for viewing and pulled off the road to join them. We were about a mile from the people packed viewing zone way in the boonies. We arrived at 10:20 and the first sliver of the eclipse started 2 minutes later. Maureen jury-rigged a filter solution for the camera and we were ready. The group all convened by us and we ended up discussing things to watch for. One of the group was a PHD candidate and had thoroughly prepared. He gave us some tips and it was back to the eclipse. No matter what we expected, we were blown away. 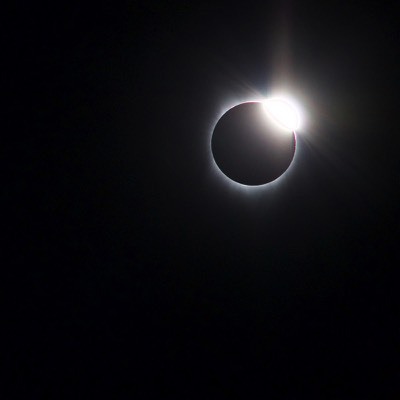 We had 1' 27" of Totality. The sight was spectacular (see below). The temperature must have dropped 15˚, there was an apparent sunset in all directions. Absolutely awesome. After 4060 miles, we have settled back into Colorado Heights. This will be home for the next few weeks as we await the final warranty work on the Solitude. And then it's back to Mesa. Both the 2008 Dodge Ram 3500 and the 2017 Grand Design Solitude have been awesome. I should add the new PullRite SuperGlide 2900 Hitch that we upgraded to due to the tighter turning radius of the Solitude has been great as well. Layover stops used to be tiring and sometimes frustrating. Now they are not an issue.